Helping to Activate the Listener"
Admission for the Performances could be given on the spot (no reservations needed). Admission to these Workshops is Rs 800 per day, or Rs 1,500 for both days. On both days, one could attend the morning and/or the afternoon Workshops. One could attend on one or both days: however, the 4 sesssions on the 2 days have been designed as a single experience. After one purchases admission, one could send an email to info@storytellinginstitute.org to reserve seats in particular Workshops on the mornings of Sat 10 and Sun 11 Feb.
(or one would be placed in one). here as a pdf file. 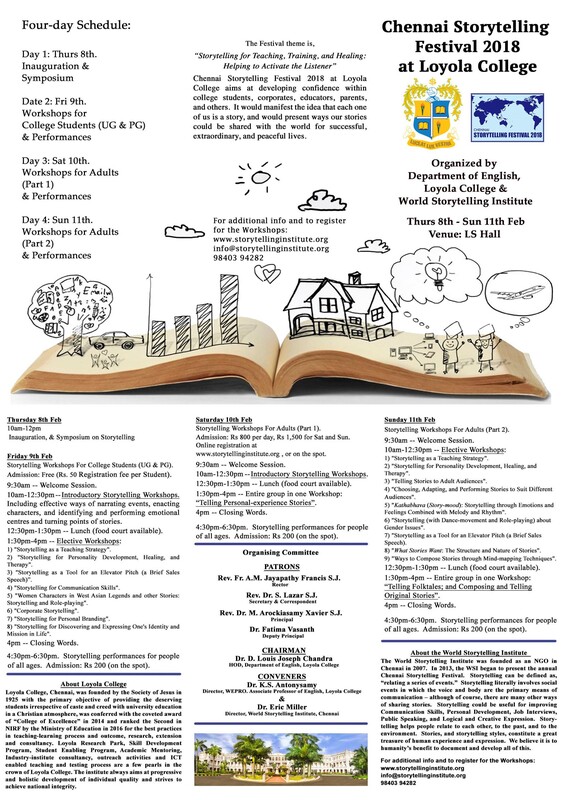 of the Chennai Storytelling Festival (2013-7) is here. Strong and Clever Girls and Women". Location: Andhra Mahila Sabha, Luz Church Road. "Storytelling Workshop for Parents and Children Together". In this informal Workshop, Parents and Children would demonstrate ways they tell and read stories to each other, and could discuss ways they might like to tell and hear stories. The Parents would begin by telling or reading aloud to the group, favourite bedtime stories they tell or read to their Children at home. The Workshop facilitators would be Cathryn Fairlee of California, and WSI Director Eric Miller (both of whom are also parents). Cathryn especially would give tips on telling stories to children. She is a leading member of the professional Storytelling community in the USA, and has made numerous Storytelling recordings (which are described and are available here). Location: 14, Second Ave, Harrington Road, Chetpet. Admission: Rs 400 per parent-and-child team. "Cathryn Fairlee's Storytelling Workshop for Adults". Topic: "Storytelling in the World Today". to water, but you cannot make him drink". please send an email to info@storytellinginstitute.org . Featuring Prof Vidya Porselvi, Cathryn Fairlee, Eric Miller, etc. 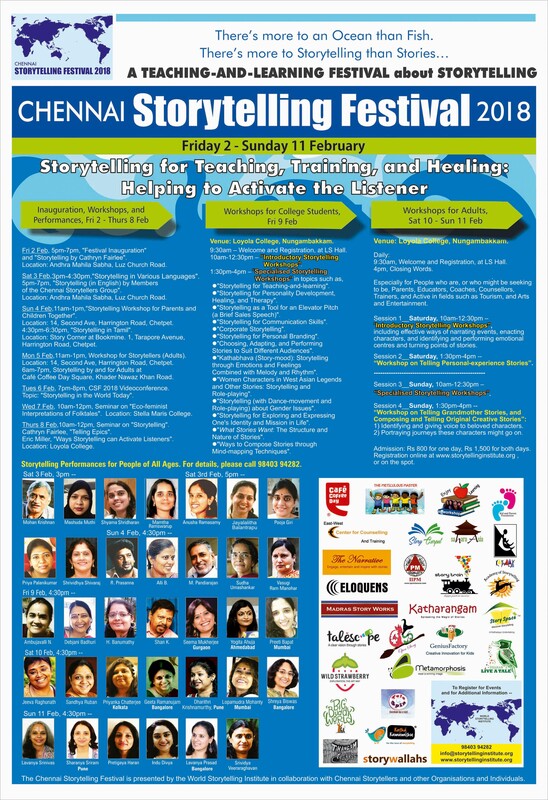 If you might like to attend, please send an email to info@storytellinginstitute.org or call 98403 94282. Eric Miller, "Ways Storytelling can Activate Listeners". If you might like to attend, please inquire. Location: No.14, Second Ave, Harrington Road, Chetpet. Fri 9, Sat 10, and Sun 11 Feb, at Loyola College. and New York City (USA) and Sweden. Admission: Free (Rs 50 Registration fee). Up to 20 participants per Section. Approx 10 Sections. These Sections would be occurring at the same time. One could choose one Section, preferably via email in advance (or one would be placed in a Section). 7 Storytellers, 12 minutes each. Admission: Rs 200. Workshops for Adults, Day 1. Rs 800 for the Workshops on Day 1 (Sat 10 Feb) or Day 2 (Sun 11 Feb). Rs 1,500 for the Workshops on both days. One could attend the morning and/or the afternoon Workshops on a day. on the 2 days have been designed as a single experience. Day 1 (Sat 10 Feb) and Day 2 (Sun 11 Feb). Workshop on "Telling Personal-experience Stories". All participants in one group, with participants at times writing, drawing, and telling -- individually, in pairs, and in small groups. (Sea-Fishing Community Cultural Festival), Day 1. Beside Elliots Beach, Besant Nagar. Workshops for Adults, Day 2. Admission: Rs 800 (in total, for morning and afternoon Workshops). Workshop on "Telling Grandmother Stories, and on Creating and Telling Original Stories". (Sea-Fishing Community Cultural Festival), Day 2. Information about the Festival-recommended hotel is here. group and other organisations and individuals. events -- please email or call.